Below you will find an impression of our jubilee weekend. During the weekend we received a lot of relations, interested people and local residents and gave them an impression of the past, present and future of our company. Hooymans Compost and the Hooijmans family wants to thank everybody for visiting us during our jubilee-weekend! On behalf of the full staff of Hooymans Compost and the Hooijmans family we want to thank everybody for visiting us during our jubilee-weekend! The Symposium on Friday, the party night on Saturday and the Open Day on Sunday were very well attended and also thanks to this it was very successful. It became a beautiful weekend! You can find an impression of this on our website very soon. Posted in Nieuws @en	| Comments Off on Hooymans Compost and the Hooijmans family wants to thank everybody for visiting us during our jubilee-weekend! Open house on Sunday 7 September 2014! 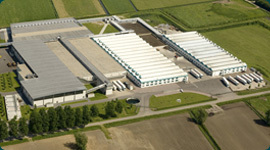 Hooymans Compost B.V. celebrates its 25th anniversary. Mainly because of fruitful collaboration with our valuable relations, we have been able to thrive over the past 25 years and have become the company as you know it today, a company we are proud of. We would like to celebrate this milestone by opening our doors on Sunday 7 September 2014 for all residents and interested people. You can visit our factory during this day from 1:00 to 5:00 pm. The guided tours will start between 1:00 to 4:00 pm from Laarstraat 6, Velddriel (The Netherlands). We welcome you that day and like to give you an impression of our company. Posted in Nieuws @en	| Comments Off on Open house on Sunday 7 September 2014! Hooymans Compost celebrates her 25th anniversary! The holidays and 2014 are coming up. Time to look back on a successful and pleasant cooperation, but also time to look ahead. The first compost delivery on August 18, 1989 was the beginning of Hooymans Compost. Next year, 2014, we look back at 25 years in which a lot has happened and changed over time, not only within our company but also within the mushroom branche. A milestone which we are proud of and which will be celebrated this year. We wish you, on behalf of all employees of Hooymans Compost BV, a merry Christmas and a prosperous and healthy 2014! Posted in Nieuws @en	| Comments Off on Hooymans Compost celebrates her 25th anniversary! 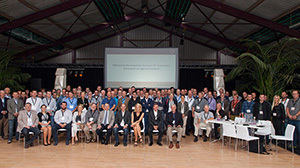 Last 29th, 30st and 31st of May the 33rd edition of de Dutch Mushroomdays was held in the Brabanthallen in ‘s-Hertogenbosch. We can look back at a very interesting and succesfull edition with a lot of national, but also international visitors. A with care and well organized trade fair in which every participant could experience that the mushroom industry is fully moving in a forward direction ! We would like to thank all those very much who visited us at this trade fair! 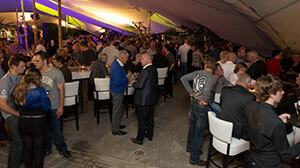 This year the Mushroom Days will take place again in the Brabanthallen in ‘s-Hertogenbosch (The Netherlands). The 33rd edition will take place from 29 to 31 May 2013 and forms the international platform for the mushroom industry to meet and share experiences and knowledge of the latest developments. 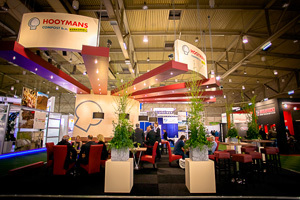 Obviously Hooymans Compost BV will also be present during the Mushroom Days 2013, we hope to welcome you at our stand. The Registration (Access) will soon be online. Visit the website of Mushrooms Days 2013 for more information. Posted in Nieuws @en	| Comments Off on Upcoming: Mushroom Days 2013! We wish you all a Merry Christmas and a healthy and prosperous 2013! Wij wensen u hele prettige feestdagen en een gezond en voorspoedig 2013! Wir wünschen Ihnen allen ein frohes Weihnachtsfest und ein gesundes und erfolgreiches Jahr 2013! Życzymy wszystkim Wesołych Świąt i zdrowego i dostatniego 2013! Posted in Nieuws @en	| Comments Off on Happy holidays! Visit us at the National Mushroom Day on 22 November! The fourth National Mushroom Day will take place on 22 November in Uden. The theme for this year is “Innovation and sustainability in mushroom cultivation”. Innovative mushroom company ‘ t Voske in Uden is this years location where various issues and innovative techniques in the AREAS of mushroom cultivation will be discussed. Since this is the location to get together with growers, suppliers and other interested parties you can also find Hooymans Compost BV here. Posted in Nieuws @en	| Comments Off on Visit us at the National Mushroom Day on 22 November! Our modern machinery to handle straw for the preparation of the compost is perfectly capable to process greater quantities during the summer period. Off course the used straw is carefully selected and appropriate pre-treated, before it is further processed in the process.